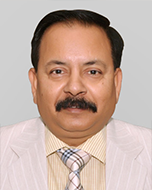 Ashutosh Verma is a Whole-time Director & Chief Executive Officer of Vikas Ecotech Limited. He is responsible for the business development and technical support functions of the company. He has a rich experience of over 34 years in the field of plastics raw material and polymer compounds. Mr.Verma is recognized as an expert in the compounding industry with knowledge in all aspects including production, purchase, sales & marketing, technical services, R&D and business development. He has been instrumental in turning the company into a world-class organisation, registering exponential growth and consistently making profits.